What browsers should I use when visiting EliteFlyers.com? We recommend using the latest version of all browsers with our website. The latest versions of Safari, Google Chrome, Firefox, or Internet Explorer are suggested. How do I contact Elite Flyers if I have any questions? We are happy to assist you by phone or online chat between the hours of 10am-12am eastern time. You may create your Elite Flyers account by clicking the "Log In/Register" link located in the header of any page, or by simply adding a product to your cart, then proceed to the checkout process. We accept all major credit cards and paypal orders though our website. If you would like to pay by direct deposit or by company check. Please contact us directly at info@eliteflyers.com. ** Please note that all payments need to be paid in full before processing any order for design or printing. If a client pays by direct deposit or by company check, all funds need to have cleared into Elite Media Grp, LLC's account before your order can progress into production. Lincoln Road & Washington Avenue on the 8th Floor Suite F of the Bank of America Building. Monday-Friday: 10am - 6pm Est. ** Dropping off a project or picking up your order and don't want to park? Can I save my billing and shipping addresses online for future use? Yes. Once you are logged into your account, click on the "My Account" link in the header section of the EliteFlyers.com website. Here, you are able to manage your "Shipping Addresses". ** Be advised that changes to your address book do not change addresses for an existing order. If you need to update an address for an order in production, please contact us immediately at info@eliteflyers.com to avoid any production or shipping delays. What if the product I am searching for is not available on your site? EliteFlyers.com can produce some custom projects that may not be available on our website. You may submit a custom quote request by clicking the “Request A Quote” tab within the top navigation of Elite Flyers. Quote requests can take up to 48 hours to fulfill and cannot be rushed. ** Please Note: The more details listed within your request will help us return an accurate quote promptly. Please list all additional instructions within the note section of the quote request form. How can I request a custom quote? You may request a custom quote by filling out our quote request form. Quotes take up to 48 hours during business days to process and respond. I have a physical sample of what I want printed. Can I send it to you to review and quote? Please understand that we cannot gurantee we can prodcuce all projects. We hold the right to refuse any project. We are not responsible for samples we receive. If you submit a sample for us to review. They become property of Elite Media Grp, LLC and we are not responsible for damages, loss, or returning the samples unless otherwise agreed apon in writing prior to receiving the sample. I received my custom quote. How long is the price good for? Estimates are good for 30 days. An estimate not accepted within 30 days would require a requote. How can I submit my order? All orders must be placed though our website. If you are having issues placing your order though our website, please contact us directly at info@eliteflyers.com. What's the process when ordering with EliteFlyers.com? Select your desired product and any additional options. You can submit your own design entirely, use our pre-made templates to design right on our site, or hire one of our pro designers. Note: If submitting your own design, please make sure you’ve followed our specifications before submitting your files. We may stop production on your project if we notice the artwork provided is low resolution, contains errors, or does not meet our guidelines. If your job is placed on hold, you may submit new artwork or decide to print as-is. We are not liable for any delays caused by a customer’s failure to follow our guidelines and specifications. If we do not hear from you within 48 hours (business days only) of your job being placed on hold, your job will be printed as-is and we will not be liable for any quality losses. Please review your files carefully. No changes can be made once we’ve received your order and approval. Confirm your billing address, shipping address, and delivery method. We accept all major credit cards and Paypal. If you would prefer to pay via direct deposit or by company check, please contact us at info@eliteflyers.com. Thank you for your order! A unique order number is generated for each order. Please reference this number if you need to contact us regarding your order. If you have hired us to design for you, please fill out the graphic design questionnaire with your instructions, logos, images, and content. We will email you an invoice and order status updates. Please add info@eliteflyers.com to your contacts to assure our emails don’t end up in your junk/spam folder. After your order is placed and all files have been submitted, we will review them and contact you if there are any issues. If files are print ready, we process your order to print on the next scheduled print run. 1. Your order has been entered, processed, and the transaction approved. 2. You have uploaded your artwork, created your artwork, or emailed your artwork. 3. You have viewed and approved your proof. 4. Your artwork has been cleared by Elite Flyers for printing. Once this criteria has been met, your order is processed on the next available print run. Turnaround time begins when the order is processed to print. Turnaround times are calculated in business days and do not include holidays or weekends. You will be alerted via email when your order is shipped. If you chose in-store pickup, we will call when your order is ready for pickup. Once you are logged into your account, click on the "My Account" link in the header section of the EliteFlyers.com website. Here, you are able to view your "Active Orders" including your projects current production status. Does Elite Flyers provide templates to help me set up my artwork accurately before submission? Yes, you may locate our templates on our template page. For easy access, a link to our template page is located in the footer section of our website under popular categories. Elite Flyers uses the latest state of the art digital and offset printing equipment to produce your prints. Short run orders of 250 and 500 are printed digitally where incremetns of 1000 or more are printed in an offset format. What resolution should by files be designed and saved at? Your files must be designed and saved at 300 dpi (dots per inch) resolution. All projects created within our designer tool are created and saved at 300 dpi resolution. If you submit low resolution artwork or files that are saved at a resolution less then required, your order will be placed on hold and we will notify you by email. It is your responsibility to revise and submit your updated artwork promptly to avoid any delay. Once we have received your updated artwork, we will send you a proof for review. Once we have received your approval, we will process your order right away for printing. What color mode should my files be saved in? Your files must be saved and submitted in CMYK color mode without any color profiles active. If you submit a file saved in RGB, your file is converted to the required CMYK color mode we use for printing. This conversion may cause a color shift to occur and you may not be satisfied with your job. We encourage to always begin and complete your artwork in CMYK color mode. If you are unsure what color mode your files are currently saved in, please submit your files via email to info@eliteflyers.com so we may review and respond right away. All projects created within our designer tool are created and saved in cmyk color mode. To learn more about CMYK vs RGB you may visit our blog post on this topic here. How should I set up my artwork for proper rotation? Elite Flyers prints our projects “Head to Head”. We require that your print ready files are set up with proper rotation. The head is always the top of your file. Please see the example below. 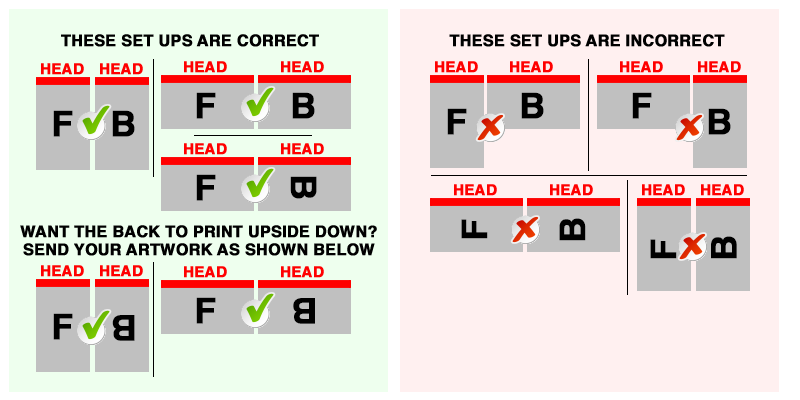 Set up your files so that when we print them "Head to Head”, the final product will read the way you intend. 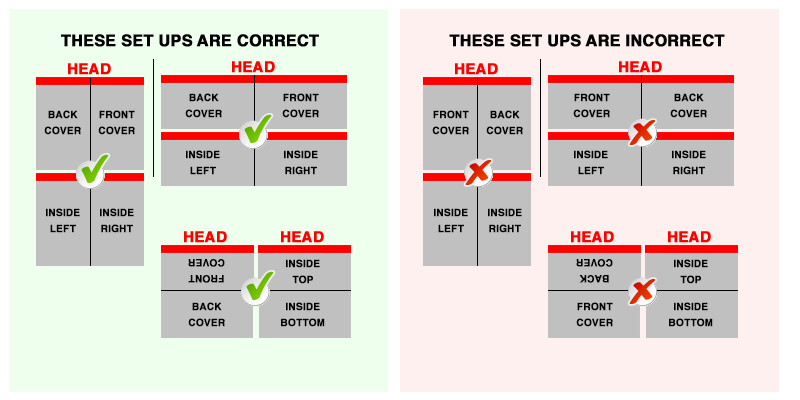 The front and back of your files need to be set up either with both sides vertically or both sides horizontally. If your project requires folding. Please view the example below on how to accurately set your artwork up with proper rotation with a fold. Elite Flyers is not responsible for incorrect rotation if your artwork was not submitted correctly. Please be sure you have reviewed how to correctly set your artwork up with proper rotation. If you have any questions or are unsure if your files are correctly set up with proper rotation, please submit your files via email to info@eliteflyers.com so we may review and respond right away. Should I send a mock up or sample file showing how my file should print? No, do not include any other files like proofs, samples, or mock files since they may be mistakenly used for printing your order. Unless requested by an Elite Flyers agent, DO NOT send files that you DO NOT want printed. Can I combine the front and back into one file? No, we require that all files are submitted individually. If you neglect to separate your files before submitting, this will cause delays and you may need to revise and send the files again. Please remember to separate the pages of your .pdf files as well. If your artwork is on one page or combined into one file and you cannot separate them, please submit your files via email to info@eliteflyers.com so we may review and respond right away. * A fee may apply to complete this task. The fee depends on the complexity of the project and is solely up to Elite Flyers to decide the final cost. How can I be sure that my blues within my artwork do not print purple? Blue is close to purple in the CMYK spectrum. When using blue colors within your design, always make sure to leave atleast a 30% difference in your Cyan and Magenta values to avoid the blue colors printing purple within the final print. Use a low amount of magenta whenever using high amounts of cyan to avoid purple. How do I obtain a greyscale image with a CMYK document? If you submit a file saved in greyscale, you can expect a color shift to occur when we convert your file to CMYK that will apprear as a green or yellow tint to your greyscale within the final print. Check the CMYK values of the grayscale in your final document. If there are any other values other than K in your grayscale image, there is a chance that the color can vary. What is rich black and how do I achive this? Rich black is the darkest and truest shade of black we can print. Rich black is an ink mixture of solid black 100% K with additional CMY ink values. This results in a darker and richer tone than black ink alone. If you print black alone as 100% K the resulting black will print charcoal and may not print as dark as you may like. Using this color combination will print as a deep dark rich black. My design has a border. Do you guarantee my design will be centered? No, Due to the nature of our cutting process, we do not recommend designs with borders. We cannot guarantee your bordered design will be perfectly centered after the cut. If you must print with a border, We suggest adding extra space between the boarder and the edge of your design. Why are my business card edges cracking? Cracking around the edges sometimes occurs when printing with dark colors or colors with high volumes of ink. There are some ways to prevent this. If you must use dark colors, use low volumes of ink. Design the "darker" side of the card as the "front" and keep the "back" as light as possible. If both sides are of the card are dark, we would suggest a laminated finish like silk or velvet lamination. These laminates protect the cards from cracking, tearing, and are water resistant. Below is a sample of a business card that has extreme cracking due to the volume of ink selected within the design. We offer folding of brochures and greeting cards printed on 100lb book and 100lb cover stock only. All brochures and greeting cards printed on card stock require a folding score and will be scored only. Your card stock brochure or greeting card will be delivered flat and unfolded with an easy folding score included. Why is there cracking along the score line of my brochure or greeting card? A folding project that is printed on card stock requires a folding score. During use, cracking may occur along this score line. Cracking is normal when coated jobs are scored and folded. As the job is used and folded overtime, cracking will eventually happen. Ordering the job WITHOUT UV will help but may not prevent this. Here are some ways you can prevent cracking along the score line. If you must use dark colors, use low volumes of ink and keep the colors away from the folding line. Design the "darker" side of the card as the "outside" and keep the "inside" as light as possible. Below is a sample of a brochure hat has extreme cracking from use over time. What radius of rounded corners do you offer? And what options are available? We offer 2 or 4 rounded corners with a .125 (1/8th) inch or .25 (1/4) inch radius. Below is an example of 1/8th inch and 1/4 inch radius rounded corners. When ordering business cards with 2 rounded corners, the opposite corners are rounded. This is better known as a "leaf cut". Below is an example of a business card with a leaf cut. When ordering business cards with 2 roudned corners, please be sure to follow the front and back business card template to help you set your artwork up accurate for printing with proper rotation. Our 2 rounded corner business card templates can be downloaded here. Below is an example of the front and back of our business card template with 2 rounded corners. It is imporant that the front template remains the front and the back remains the back.